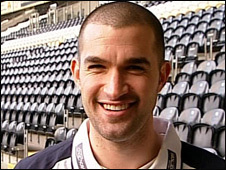 West Bromwich Albion have signed Wales international goalkeeper Boaz Myhill from Hull on a three-year contract. The Tigers accepted a £1.5m offer for the 27-year-old who made 277 appearances for them since joining from Aston Villa in 2003 for £50,000. "I'm delighted to welcome Boaz to the club," said new boss Roberto Di Matteo. "He joins us at a good age and with a good pedigree, having helped Hull win promotion to the top flight and spent the last two seasons there." With debts in the region of £25m - £10m of which is owed to other clubs - Hull's head of football operations Adam Pearson admitted they had to raise money this summer. But Di Matteo said he was looking forward to the upcoming Premier League season with added competition between Myhill and captain Scott Carson. "Boaz obviously knows what it takes to play at the top level and he is also a good character," he told the club's website. "We've now got two very good international keepers working under our goalkeeping coach Dean Kiely. Competition is vital is all areas of the squad and I'm confident Scott and Boaz will drive each other on." The United States-born keeper joined Hull when they were in the bottom tier of the Football League - and enjoyed three promotions with them, followed by this summer's relegation from the Premier League. Meanwhile, former Hull captain George Boateng has joined Greek side Skoda Xanthi. The 34-year-old has been linked with West Brom and Celtic this summer after his contract expired following the Tigers' relegation.